In a previous semester, I asked my students a question I wanted to hear their thoughts on. They answered this question on their websites/ePortfolios as reflective essays: what was the best piece of writing that you did this schoolyear (in any class) and why do you call that your best? The students’ answers astounded me, particularly the way in which those students most interested in social justice (and I mean social justice as a process and life commitment, not a graded school assignment) answered so fundamentally differently. Those students who I would most call activist and conscious talked about what they learned about the world and themselves; how they had committed to social justice issues more than ever before; why they saw themselves as people who had creative and/or political agency to change the world, help their families, and/or write in a way that reached and impacted people. Some of them even wrote this final reflective essay as a letter to their mothers explaining their gratitude and respect or as a letter to a younger version of themselves explaining all that they would soon become if they could just survive that current, ugly moment. On August 15, 2015, Janelle Monae and her Wondaland labelmates gave a free concert in Washington D.C. that was only advertised on social media. Before the show, Monae and the Wondaland crew led a rally through the streets of D.C. that included a stop at the Capital. The rallying song/chant represented her new song, “Hell You Talmbout,” dedicated to the Black Lives Matter Movement, freely available to anyone on Soundcloud. On her instagram page, Monae explained the message of the song: she channels and records the pain of her people, her own political convictions, and a challenge to those who remain indifferent. I’ve decided to use this song as the soundtrack of the homepage of my fall 2015 English 101 course to capture how we will approach writing. 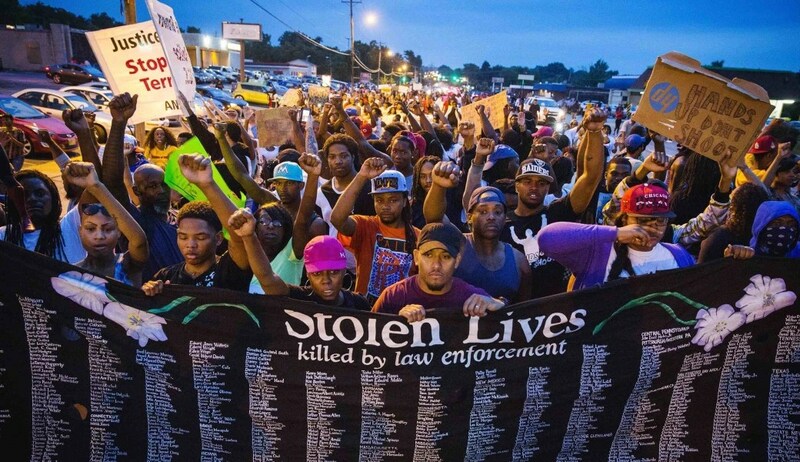 My 2014-2015 schoolyear was bookended on the one end, by the murder of Michael Brown, uprisings in Ferguson, protests in NYC over the strangulation of Eric Garner, the brutal kidnapping of the 43 college students in Liguala, AND on the other end, the uprisings in Baltimore. Though I haven’t written about it yet, I began teaching first year writing this year in collaboration with a Latin@ Leadership program called ¡Adelante! at my college. I try my best NOT to write about the classes and students who I am currently teaching (mostly because them younguns are on here readin). I will forsake that personal rule this time though. I really can’t imagine what this schoolyear would have been like had I not had the ¡Adelante! students in my life. I have been absolutely exhausted and depleted watching yet another and another and another public execution of a black person. The violence against we brown and black bystanders puts us at risk of all kinds of mental, emotional, and psychological harm too. It has become crystal clear to me that I do not have the patience or inclination to sit in a classroom with young people, especially if they are majority-white, who do not see that the annihilation of black and brown bodies, their language values, and their epistemological systems is REAL and that the wherewithal to fight it, by and with any means necessary, is the most radical intellectual work you can undertake.